I like my hobbies. They give me lots of stories to tell. A while back, the random number generator told me to write about one of the games that I’ve beaten, however, I’ve been procrastinating about it for some time now (of course while also playing lots of new games). The game was LarryBoy and the Bad Apple on the PlayStation 2. To explain why I played this particular game, I’ll need to explain what VeggieTales is and why it was so cool when it first came out. Nowadays, lots of our entertainment comprises of 3D rendered content, whether that’s monoscopic or stereoscopic 3D videogames, films, or television shows. It was not so prevalent when I was born though. There are plenty of full length 3D animated films available today, but the very first one was Toy Story which came out in 1995. Every film in this category came out in the past 20 years, which in the grand scheme of things is not a very long time. 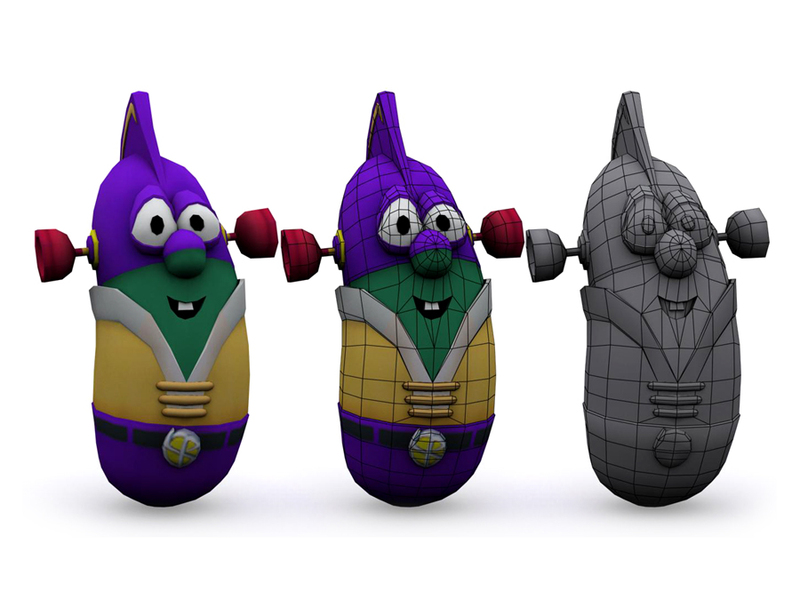 Before the first Toy Story movie came out, there was a “straight to VHS tape” series that was fully rendered in 3D. 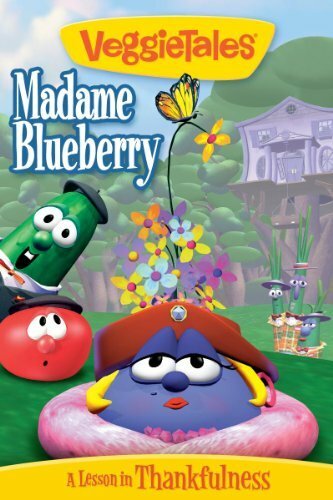 This series was VeggieTales, whose first episode came out in 1993, when I was 1. It must have been the coolest thing around. 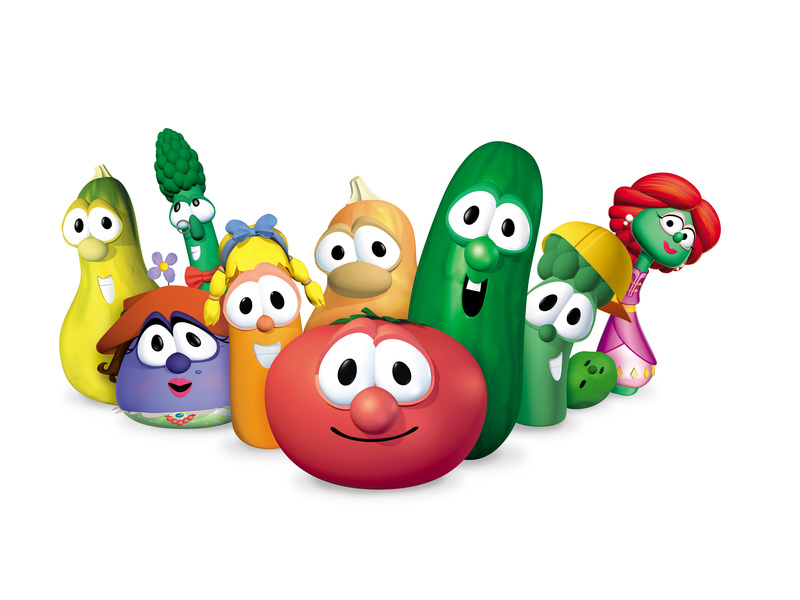 At the time, there had never ever ever ever ever been a show like VeggieTales. They even say so in the theme song! VeggieTales was really great. I think I discovered it when I was about 4, when VeggieTales was 3 years into its run and there were only 5 episodes of the show. I think one of my cousins showed it to me after discovering it himself when he went to college. 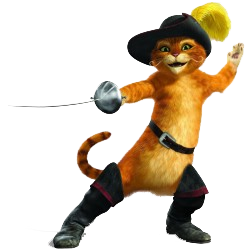 At the time, 3D animation was very exciting no matter what age you were because it was so new and fun. I’m sure many of us don’t even notice it today when we see it, because it’s become such a staple of entertainment in our society. It’s a technology that no longer seems new. VeggieTales episodes often feature moral dilemmas, sometimes through the retelling of Bible stories but also through original stories. There is always some humor to be found in the episodes, even though the plots of some of them can be slow for older viewers. I kept up with the series until about 2001 when I was 9, but the show seems to have continued at a steady pace. My favorite character was LarryBoy, the alter ego of Larry the Cucumber. 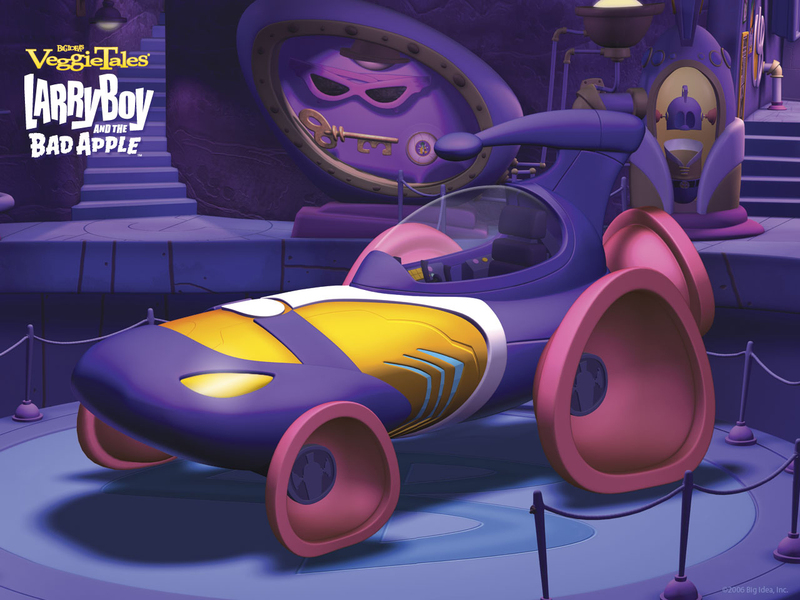 Of the episodes that I watched, LarryBoy was in three of them, and was featured heavily in the two of them that took place in the fictional city of Bumblyburg. 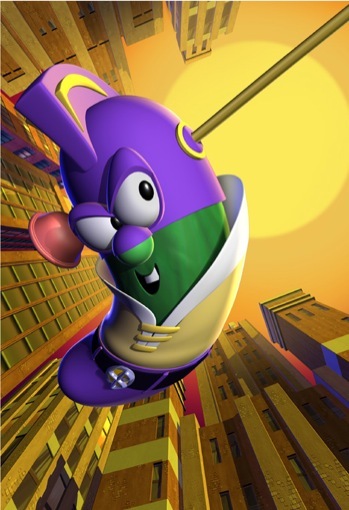 LarryBoy is a superhero similar to Batman, but he’s also a vegetable like most of the characters in VeggieTales. Sometimes characters can be fruits. After all, Bob the Tomato has seeds and is thus technically a fruit. 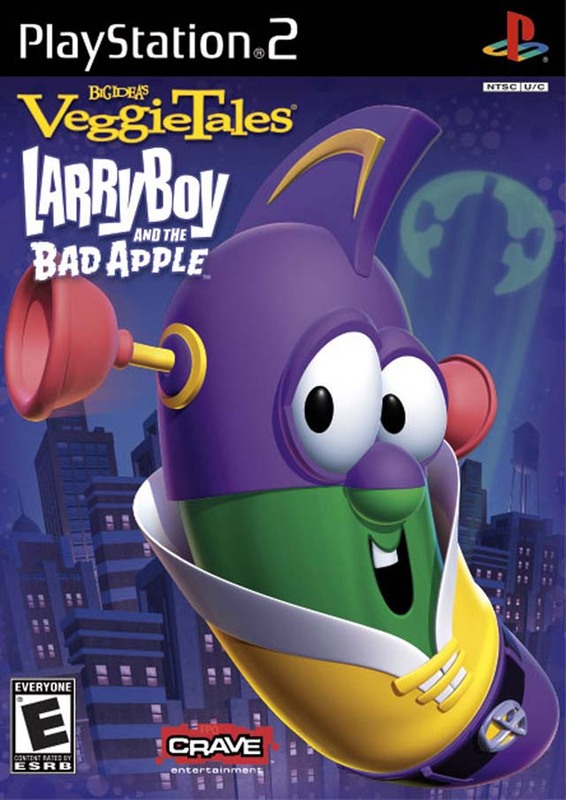 Years after I stopped following VeggieTales, I was going through a shelf of old PS2 games at a GameStop store, and I found a game called “LarryBoy and the Bad Apple”. The game is based on LarryBoy’s third adventure of the same name. I hadn’t seen the episode, so I figured that playing the game would be an approximation of watching the episode, but with added interactivity. That’s when I decided that I would play through the game. 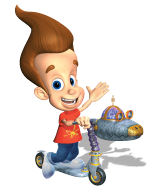 It was a pretty fun experience simply because I grew up watching LarryBoy and had sort of thought that a game about him would be cool. 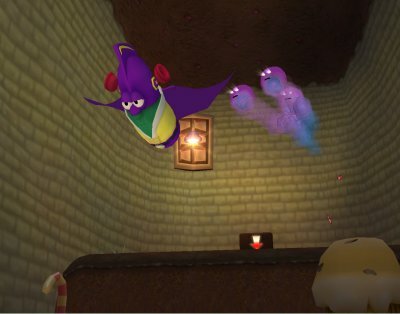 The gameplay was especially good in the segments of the game in which LarryBoy has to fly through the air. As a whole, the game mostly consists of puzzles and platforming. There are cutscenes taken directly from the VeggieTales episode that the game is based on. LarryBoy isn’t completely based on Batman. They went ahead and threw in a reference to Spider-Man too. 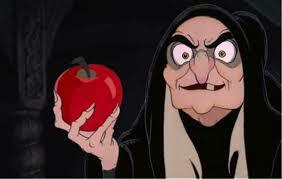 The main villain is an Apple who personifies temptation. This is especially interesting because as VeggieTales is limited to a cast of vegetables and fruit, casting the villain as an apple that tempts people cleverly draws a parallel between the villain in this story and the Apple of Eden that tempted Adam and Eve in the book of Genesis. In that way, this was both an original story and biblical. 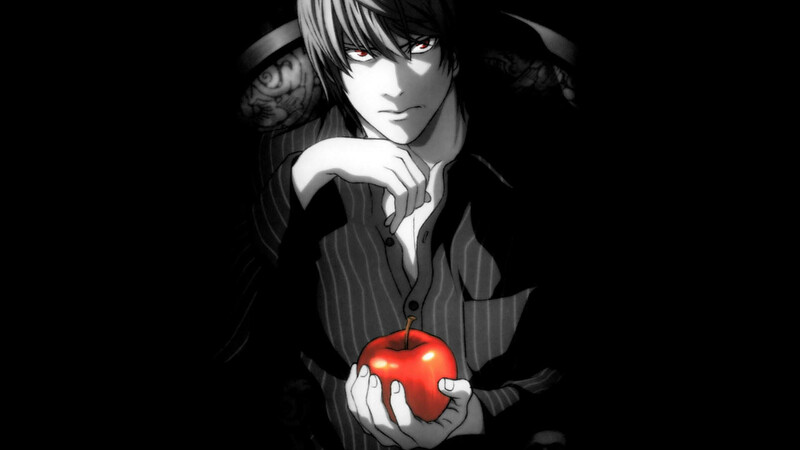 The thematic use of apples to represent temptation and evil is quite old and prevalent throughout literature and other media. The main villain is called The Bad Apple. She is an apple who tempts people. LarryBoy’s temptation is eating too much chocolate. A witch tells Snow White that eating this apple will grant her a wish. Snow White gives into her temptation and eats it, but it is poisoned. The villain, so called “The Bad Apple”, goes around tempting people to neglect their responsibilities to do other things they’d like to do instead, getting the mayor to vainly obsess over her appearance and a cook to watch an entire science fiction TV series. LarryBoy breaks people free from their temptations by completing levels, each one given the theme of the person’s temptation. Ironically, one of the people in the game who the Bad Apple has tempted is someone who wants to play video games all day. What’s ironic about this is that in order to make this character pay attention to their real responsibilities, you have to beat a level of this real life video game. 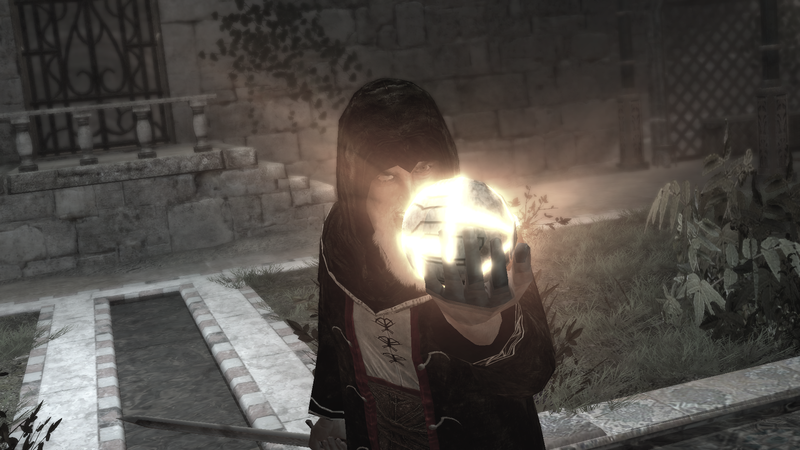 The moral of that chapter is to not play videogames all day, and yet this is exactly what I did to finish this game. Am I subject to temptation? Absolutely. Do I give in to my temptation? Oh yes, definitely. That’s how I beat so many games.